You’ve done it! You’ve got your ticket for Miami! You found a great airfare deal and a hotel. You’ve booked a few fun tours and have plenty of time set aside for sunning on the beach, eating and clubbing. There’s just one thing you haven’t figured out yet: how do you get from the airport to your hotel? The answer depends a lot on you. For example, will you be traveling alone or with a group of friends? Do you want to save money, or just get straight to your hotel with a minimum of inconvenience? Don’t worry, we’re here to help. You can explore your options and decide what works best for you! The rates quoted here are effective as of February 2012. Is getting there cheaply the most important consideration, and you don’t mind if it takes a little longer to get there? 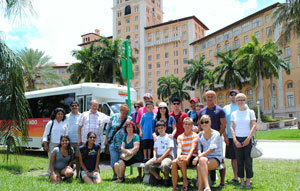 Then, if you’re heading from Miami International Airport to Miami Beach, the Airport Flyer Bus is your best bet! It used to be that to get from the airport to Miami Beach, you had to change buses a couple of times, and it would take forever. 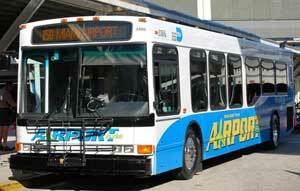 But all that changed in December 2009 when the Airport Flyer bus began service! Making only one stop—at the Earlington Heights Metrorail station—before arriving in Miami Beach, its route takes you along the Airport Expressway and the 195, also known as the Julia Tuttle Causeway. After a couple of stops at Alton Road and Sheridan Road, the bus heads south along Indian Creek, starting at about 41st Street. At 26th Street, it crosses over to Collins Avenue, and then to Washington Avenue at Lincoln Road. The bus continues downward to South Pointe Drive, the southernmost point in Miami Beach, before looping around to head back to Miami International Airport. It runs 7 days a week between the hours of 6 am and 11 pm, and costs just $2.35 per person! See the route (PDF). Unfortunately, getting from Miami Airport to the Port of Miami on public transportation is more difficult. To get to the port by bus, start at the airport on the 150 bus to Earlington Heights Metrorail Station. Take the metrorail south to the Government Center Station. From there, on weekdays, you can catch Bus 243 to your cruise terminal. On weekends, you’ll need to take a taxi once you arrive at Government Center. If you need to get to other areas of Miami, the fares will vary depending on the number of buses you’ll need to take. The basic Metrobus fare is $2. Express buses are $2.35. If you plan to be using the bus more than five times during your time here, the Easy Card is your best option. This reusable card requires that you load a minimum of $10 on it and gives you 7-day passes for $26 and month-long passes for $100, in addition to free bus-to-bus transfers. And it’s also good for travel on the Metrorail system! Furthermore, If you’re elderly or a disabled Medicare recipient, be sure to ask for a Discount Easy Card, which will reduce your fares by half. Need to get somewhere, but you’re not sure which bus to take? Just use the Google Transit Planner.Tell it your day and time of travel, as well as your starting and ending points, and it will tell you which buses you need to take. Ah, the joys of 21st century living! Well, although we are living in a new age, getting to Fort Lauderdale on public transportation hasn’t improved much since the horse and buggy days. The number of transfers and the amount of time it takes make it a poor option for travelers with luggage in tow. However, if you just need to get to your Miami Beach hotel, public transit is a great, inexpensive way to do it! If you’re traveling by yourself and you want door-to-door service to your hotel, the Super Shuttle is usually a little cheaper than a taxi. This service requires no advance reservation and is available 24-hours a day at the airport. If you’re going to Coconut Grove, downtown Miami or to the Port of Miami, the rate is set at $14 per person. South Beach and Mid-Beach hotel destinations cost $19 per person, while North Beach and Bal Harbour are $20. You can take the Super Shuttle to Fort Lauderdale as well, to the Fort Lauderdale Airport ($28 per person), downtown Fort Lauderdale ($40 per person) or Port Everglades ($30 per person. 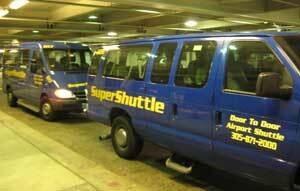 Both taxis and shuttles are available outside the baggage claim area of the airport on the lower level. If you’re starting at the Fort Lauderdale airport, Super Shuttle used to provide service originating from there, but it was recently discontinued. Go Airport Shuttle is the shuttle you want to use! Their rate to Miami hotels is $28 per person. The advantage of a shuttle is that you can save up to 50% off the cost of a taxi. But lest you forget, this is shared transportation. That means that it can take significantly longer than a taxi or private shuttle, depending on the number of people with you on the van that day. Also, unlike private shuttles, the tip is not included. Plan to tip your driver about 15% of your fare. If you plan to be in a party of 2 to 5 people, taxis are generally your least expensive option, especially if you will be going to the Port of Miami or to Miami Beach, where there is a mandatory flat rate. If you’re going from the airport to the Port of Miami, that rate is $24. They can’t charge you a penny more! If you’re going to Miami Beach, South Beach and Mid-Beach will cost you a flat $32 fee; North Beach is $37 and Bal Harbour is $43. If Sunny Isles is your port of call, plan to fork out $52. Downtown Miami will set you back about $21.70. The flat rate to the hotels on Key Biscayne is $41. 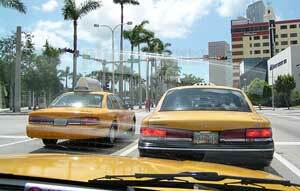 Taxi service to Fort Lauderdale isn’t a flat rate, so just be mindful that your driver doesn’t take the scenic route! Prepare to spend about $72.00 to go to the Fort Lauderdale airport, $81.00 to downtown Fort Lauderdale, and $77 to Port Everglades. Taxis are a good option for getting right to where you need to go, but you’re at the mercy of the driver when traveling outside flat rate areas, especially if you’re not too familiar with the area. Also, as with the Super Shuttle, you’re expected to tip your driver about 15% of your fare. Private transportation combines the convenience of a taxi with the benefit of knowing how much you’ll have to pay before you arrive. It’s like being on vacation with your own private chauffeur! Miami Beach 411 offers private transportation that you can book right through our website. It’s ideal for the traveler that has planned his or her transportation needs out a little in advance. If you plan to be traveling longer distances, or locally with a larger group of people, having your own private driver can save you a bundle of time, money, and aggravation. When you book with Miami Beach 411, you’re given written confirmation by email letting you know the name of your driver and his cell number. Unlike a shared shuttle, you’ll be the only passengers on board—so you don’t have to sit there twiddling your thumbs while other people are getting on or off ahead of you. And— depending on the size of your group and the distance of your trip—private transportation can actually work out to be cheaper than a taxi! If you’ll be going one-way from Miami Airport to Miami Beach or somewhere else in Central Miami, you’ll pay $84 for 1-6 passengers with Miami Beach 411’s private transportation; if your group is 7-11 people, it will come to $126, while 12-14 will cost $150 total. What’s great about this option is that with Miami Beach 411, there are no hidden charges! No tolls, taxes, or port fees to worry about. Even the tip is pre-included in the price! If you’ll be traveling round trip, just double the rates and take off 10%, the amount of the round trip discount. If you’re going one-way from Miami Airport to the Port of Miami, the rate is slightly more: $96 (1-6), $138, (7-11), and $162 (12-14). If you plan to have more people in your group, or maybe you have a more complicated itinerary, just call us at 305-754-2206 and let us know! We can help you find the most budget-friendly options for your group. To go from Miami, Miami Beach or Miami Airport to Fort Lauderdale, the rates are set at at $102 (1-6), $144 (7-11) and $168 (12-14). Round trip discounts are available. If you need to go from Miami, Miami Beach or Miami Airport to Port Everglades, the one-way rates are $114 (1-6), $156 (7-11), and $180 (12-14). Browse More Private Transportation Options. Your driver will be waiting prior to your arrival in the airport’s cell phone parking area, so there is little to no waiting. Private transportation can frequently be your best option, assuming that you’ve planned ahead. Due to the high demand, there is a 72-hour cancellation policy. As long as you let Miami Beach 411 know at least 72 hours before your trip that you need to cancel, there is no cancellation penalty. So, while transportation in Miami may not be as efficient as New York or San Francisco, there are nonetheless options for every traveler’s budget. From buses and shuttles to taxis and private transportation, there is something for everyone! Need help booking? Call us at 1-305-754-2206. We’re open from 9am to 7pm everyday.